At the world's leading trade fair for bathroom, building, energy and air-conditioning technology ISH, the main customs office in Darmstadt secured numerous plagiarisms this year as well. A total of 761 suspected cases of high-quality fittings, pumps and showers were uncovered. These mainly came from China and occasionally from Turkey. The number of counterfeits has more than quadrupled: at the ISH 2017, the main customs office in Darmstadt seized 169 counterfeits. The customs tour has been carried out at ISH since 2007 and is a proven measure in the fight against product piracy. 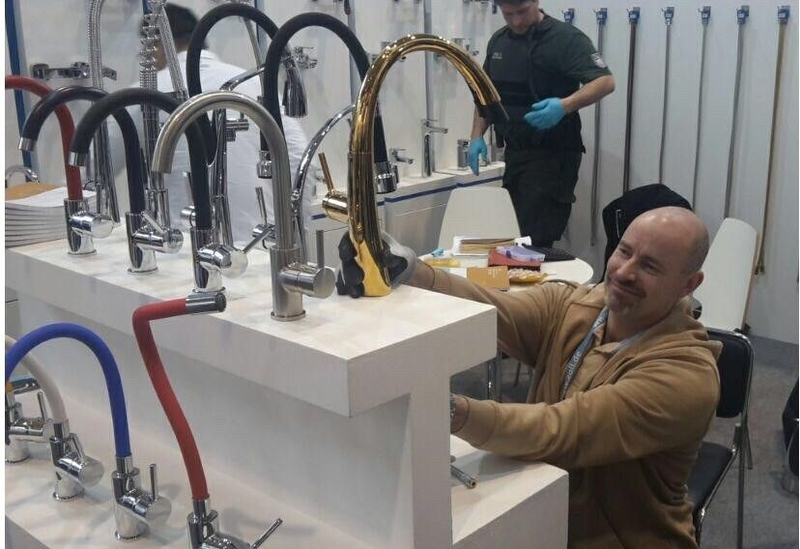 The customs inspection tour initiated by the VDMA German Valve Manufacturers Association (Fachverband Armaturen ) was mainly carried out in Hall 1. For two days more than 15 employees of the main customs office in Darmstadt as well as representatives of property right holders were involved, including the Blue Responsibility members Dornbracht, Franke, Neoperl, Schell and Oventrop. The German sanitary manufacturers live from their high creativity, their quality standards and their innovative products. As industry pioneers, they are strongly affected by product imitations. For this reason, the Blue Responsibility sustainability initiative with its 14 members takes a clear stand against plagiarism. "We have to defend ourselves against the ongoing product piracy. The customs inspection tour allows us to effectively put a stop to product counterfeiters and send out a public signal. Design can be imitated to some extent - but not sustainable brand quality," comments Wolfgang Burchard, spokesman for the Blue Responsibility initiative. Since sanitary plagiarisms are usually made of inferior materials, consumers take a high risk when buying them. In the worst case, the plagiarisms are contaminated with substances that are hazardous to the environment or health. Cheaply produced copies often wear out faster than the original and have significantly worse life cycle assessments. Plagiarism is therefore not sustainable in any way, but harms both buyers and the German sanitary industry, which has suffered economic losses and job losses as a result.